inscription: Per S.B. - Verso: "Pond Farm" and mark (jug); "15-"
Per S.B. 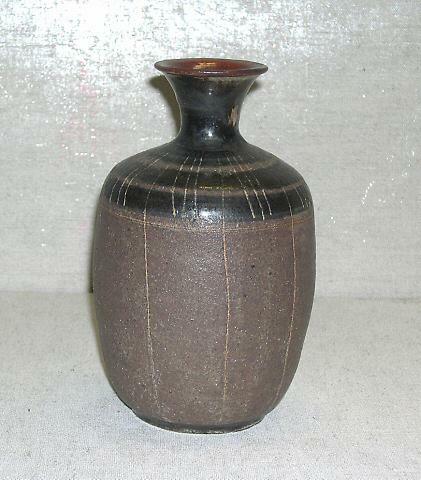 - Small vase of buff stoneware. Dark brown and black glazes on exterior, high gloss reddish brown on interior. Precise, fine, inscribed line work (scrafitto) decorates the body with vertical marks, increasing at shoulder, stopping as neck narrows, and widening on the flaring lip.